… and names can be forgotten as the years roll on. But at a recent reunion of farmers – ‘Back to Parawa 2013’ – the organisers thoughtfully and most cleverly, had name tags for everyone attending – in BIG WRITING. As it was 30 years since the last reunion, this was brilliant – especially when they also added the maiden name of the married ladies. This was particularly helpful for some of us who had not been born and bred in the area, and had no idea of many family connections after marriage and name changes. What a joy to find friendships unchanged by time, and to have a whole weekend to share our reminiscences. If you wanted to attend all of the celebrations, they started with a light lunch on the Saturday, and then dinner and entertainment (by an extremely funny Bush Poet) in the evening; a church service in the local church and another lunch – a BBQ this time – and then the afternoon stretching out for more sharing and caring. All of this took place in a huge marquee attached to the old fire shed… except that, to some of us, that was the new shed – we hadn’t seen it before. But the newer fire shed convinced us that progress had most certainly happened. They had a modern firefighter’s complete suit there on show – a far cry from how the local farmers used to turn out when the fire call came – usually in jocks under their milking overalls, complete with rubber boots and no headgear except caps and beanies. How did our guys survive? True grit once again, I guess. The organisers had done a huge job of assembling all manner of memorabilia and photos of times past in the local hall – what a wondrous collection – and how the memories were stirred. So much gets forgotten when your life is now somewhere else, being lived in a totally different way… and in a different era, too. Even in a different century! In the paddock surrounding the Parawa hall, some generous farmers had old machinery on show. More memories. How did they (and we) cope? Probably due to having no money to spare, which tends to equal no choice but to ‘get on with it’. Were we REALLY that young? 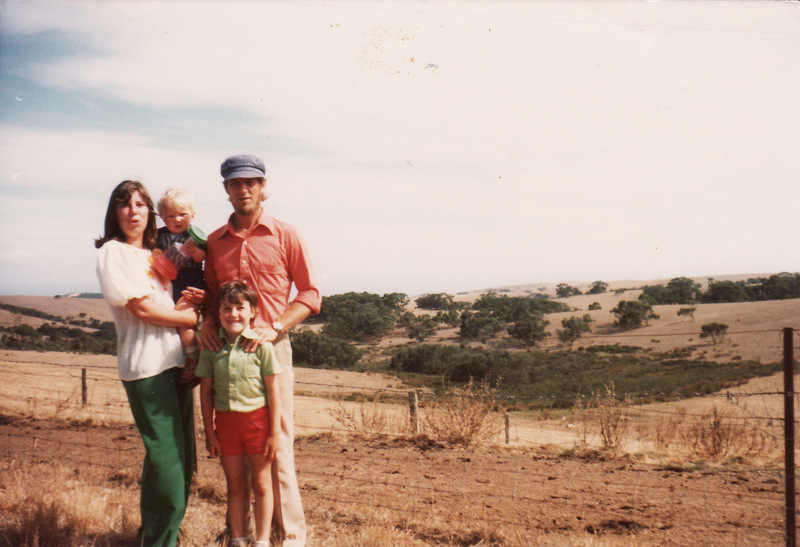 … pre beautiful daughter days. Funny, there was one good-looking fellow who was vaguely familiar somehow, who told me I hadn’t changed a bit. When I discovered he was one of our eldest son’s friends, I had to tell him that he most certainly had! He was only 11 the last time I saw him… now he’s 41. Hmm! Photo quality? Not on this dark and wintry day! At our reunion, we all remembered sights like this – only too well. 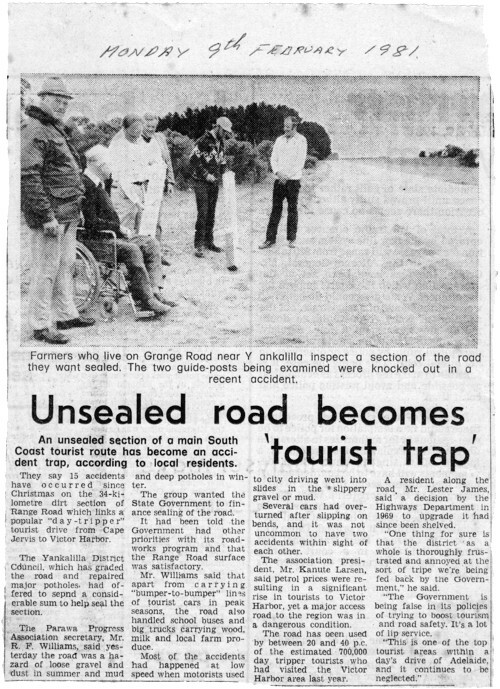 And the battle we had with the ‘powers that be’, road authorities, council and the like, to get them to do some much overdue work on it, for all our sakes. A monumental struggle – finally won after SO much effort. So our much maligned Range Road was finally bitumenised and was a joy to drive on at our Back to… reunion. Could not unfortunately say the same about the side road we lived on. 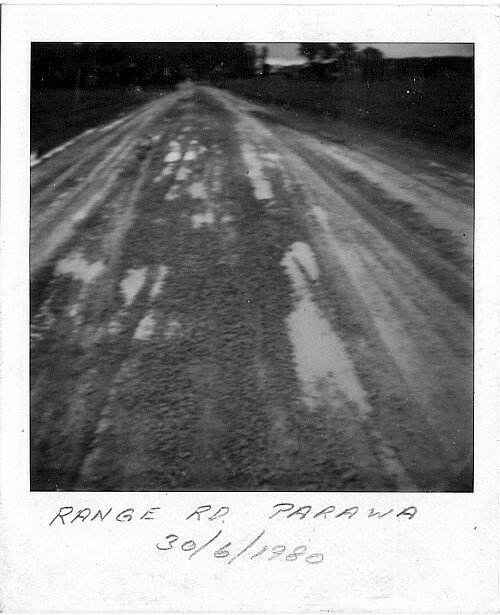 No change to the dirt road, its corrugations and potholes, its nasty build-up of gravel on dangerous curves. But the trees! Grown huge now… changing the landscape into a place with an almost dream-like quality, as far as memories go. Wish I could say something kind about our poor old dairy and house as they are today… but I don’t think I’ll go there. Our old farming friends agree. There is little left of the way of life we all shared, and the progress of today is not what we aimed for 30 years ago. But that, of course is Life.